Well, I haven't done this for a while! My apologies. Since the season has just finished, I will be reviewing the episodes I've missed from latest to earlies in the upcoming weeks. My verdict? It was rather awesome. Not sure if it will be in my top 5, but it's fantastic for what it is. It was very Disney - we got a prince and a princess about to get married and a treacherous villain trying to stop them. A villain with a swarm of evil mindless minions, I might add! There were some heartfelt songs that, I'm sure, were purposely Disneyesque. Especially since we've finally heard an evil character sing, as they tend to do in Disney movies. That's all good. Now what makes the episode awesome? Spoiler alert, if you haven't seen it! The changelings look pretty badass! I thought the queen didn't look all that great in the show's visual style, but I love the concept anyway. The hungry swarm of these bug-like creatures just looked like the MLP version of Tyranids. Another thing I loved was that not only did queen Chrysalis simply defeat Celestia, but the mane six haven't even had a chance to stop her. Sure, she was beaten by "the power of love", but let's face it, it's a more original solution than just using the elements of harmony and their giant rainbow death ray. What could have been improved, imo? Well, much like the other two-parters, it felt rushed. I guess we are kind of used to it by now. I know this can't be done, but I wish MLP was a slower-paced series with multiple intertwining plot lines. For example, I would have liked to see Twilight wandering through the crystal caves for a few days while the villain tries to convince her friends that everything's fine, or replaces her with a changeling and the friends are starting to notice something's not quite right. Instead, Twilight escapes the caves in no time at all, which makes it sound like the evil queen was majorly exaggerating when she said you could wander in the caves forever. And once again, we get the effect of "Oh look! An awesome villain! ...and they've killed it". I know it's too much to ask for from a kid's show, but I think it would have been a lot more interesting if it didn't have a predictable "problem-solution" structure to every episode. (Then again, we got "Swarm of the Century". The ending made me happy). Okay, since during all the weeks I've missed I've only been looking at art, I'm just gonna feature a lot of images this time! 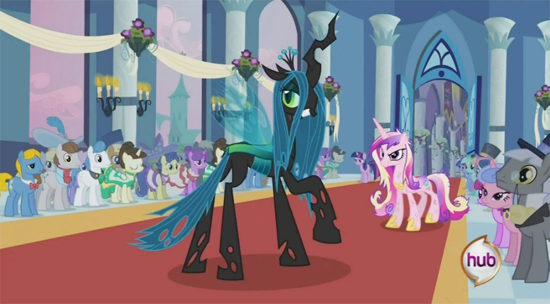 Queen Chrysalis in all her glory. She might as well be saying:" That's right! No one cares about you, ponies! It's all about us changelings now."